Depending on the type of diabetes, diabetics check their blood sugar anywhere from one to eight times a day. It’s a ritual they know well: prick your finger, draw a little blood and place it on a disposable plastic test strip that gets read by a meter. One test, one strip. America’s 21 million diabetics spend close to $4 billion dollars every year on test strips. Because of their price, though — a single strip can cost over $1 — an informal, “gray” market has emerged where diabetics like Rushing can buy the strips more cheaply, but without oversight from the Food and Drug Administration. Rushing wanted to test frequently, hoping to manage his blood sugars that way. But his insurance only covered one test a day. Additional strips would cost him $1 each, cash. At the rate he used them, that would add up to $180 a month. “So I started looking online and found I could get a box of 50 test strips on Amazon for 12 bucks,” Rushing says. That comes out to about 25 cents a strip, a fraction of the price. “That’s what I’ve been doing ever since. I’ve never even filled my prescription,” he says. Rushing found a workaround to pay for his extra test strips. 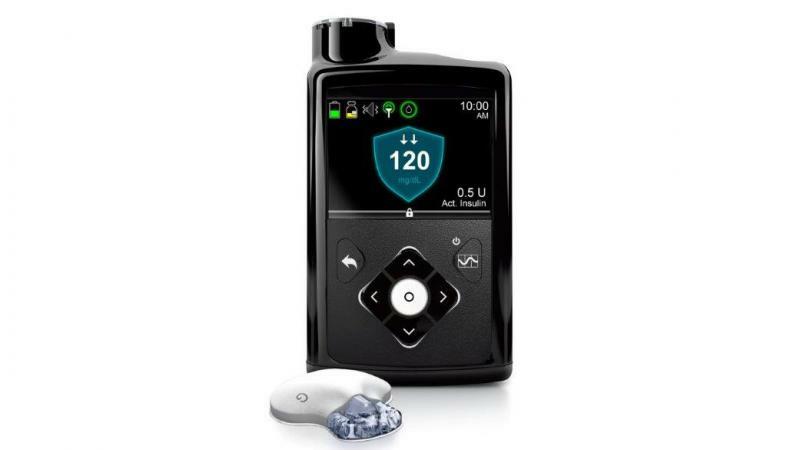 But even for diabetics who only check once a day, without insurance, costs can be prohibitive. Even if you just check once a day, for the uninsured, that’s $365 a year that hits tight budgets hard. Especially since there are other essential costs of care too, totaling around $7,900 annually on average. And this is driving demand for this informal gray market. There's little doubt that cheaper test strips could be helpful for a lot of people. In Missouri, for example, where this reporter lives, almost one in ten adults has diabetes, and 20 percent of that population makes less than $15,000 per year. But there’s also a lingering question: where the do the test strips come from and can they be trusted? These ads are posted by the middlemen of the informal test strip market. Most of them are uncomfortable talking to journalists. While their work is not inherently illegal, none of the people contacted for this story would go on the record except one, Chris, who didn’t want his last name published. Chris is 28, lives in southeast Missouri, and says he’s been selling test strips for about five years. His says he buys leftover test strips from people who longer need them. “Typically doctors switch [test strip] brands on them so they’re left with these extra boxes [of test strips] they’re just going to end up throwing out,” Chris says. Chris pays $10 to $20 for a box that might cost $50 dollars in a pharmacy. Then he sells them on his website. Even if he doubles the price, it’s still cheaper for a lot of diabetics than going through a store, especially if they don’t have insurance. A box of 100 of the popular “OneTouch Ultra” test strips, for example, retails for $145 at Walgreens for buyers without insurance. On Chris’s website, the price is $87. “We’re not just in the business to make money, we're saving other people money as well,” Chris says. But there are some legitimate concerns about the market, too. 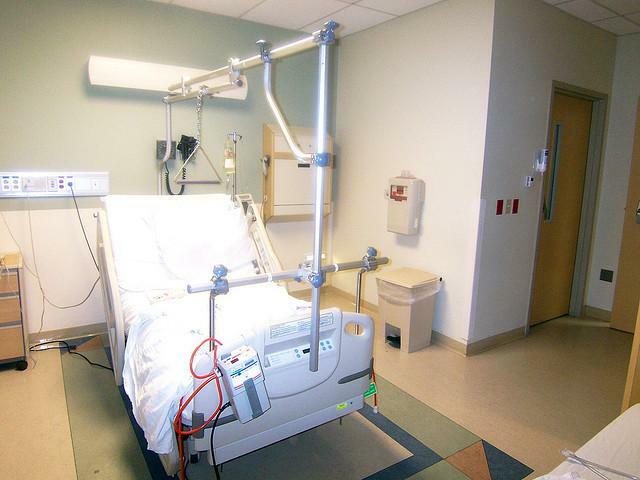 “Durable medical equipment is an area that’s rife with fraud, and diabetic testing strips are one of those areas,” says Rosanne Peregine, a special agent with the Office of Inspector General (OIG) in the U.S. Department of Health and Human Services, who has since left the agency since this story was originally reported. Re-selling test strips isn’t illegal in and of itself, she says. The problem comes when the test strips entering the informal market were originally paid for by the government. Diabetes care is a huge expense for Medicare--it accounts for one third of every Medicare dollar spent. If someone orders too many supplies through Medicare and flips the extras, the government just subsidized that profit. That’s fraud. An investigation by OIG identified $425 million in “questionable billing” to Medicare for diabetic test strips in 2011 alone. It’s difficult to determine how much of that is legitimate fraud. Buying secondhand test strips is also potentially dangerous. 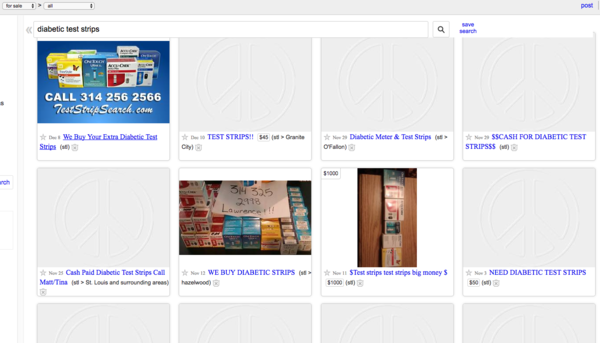 Unlike in a pharmacy, there’s no oversight or regulation of the storage, transportation and quality of the test strips these dealers are selling, so consumers risk buying bunk medical supplies. “You’re running the risk of getting inaccurate readings and having your blood sugar way out of whack,” Peregine says. That can mean short-term complications like hypoglycemia, and long-term complications like foot conditions, kidney disease and even strokes. He says he doesn’t buy strips if they come from Medicare — they're usually marked with a label, he says. He also says he checks the strips to make sure they’re not expired and stores them in his own home. “I take strides to make sure I take equal or better care of them than in a store,” he says. For consumers like Tim Rushing, it’s almost impossible to know where his strips come from, so he checks the quality on his own. Most meters that read the test strips come with a control solution that lets you gauge the accuracy. “I might test [a batch of test strips] multiple times, and I’ve never had what I felt was a bad batch,” Rushing says. He’s even found a seller on Amazon who is only two counties away from his house to cut down on the time his test strips stay in transit. “I’m to the point now where I’ve had no issues or concerns about quality and I feel that what I’m getting is just as good as what I can get at my local pharmacy,” he says. He says he does wonder about the morality sometimes. “If somebody’s desperate for cash and is more willing to sell the strips than actually use them, that makes me uncomfortable,” he says. But for now he’ll keep paying cash and saving money. Copyright 2017 Side Effects Public Media. To see more, visit Side Effects Public Media. 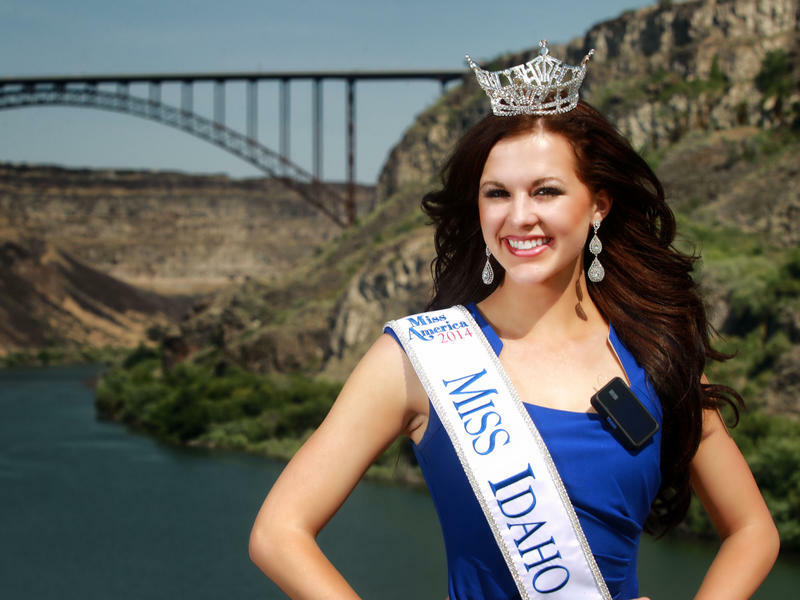 There she is, Miss Idaho. And there it is, the insulin pump attached to her bikini bottom during the swimsuit competition. Since posting the photo on social media on Monday, Sierra Sandison has become a new hero to the Type 1 diabetes community. The Missouri Hospital Association says there has been a decline in the number of hospital admissions for preventable issues. This is the third story in a series from the Health & Wealth desk on Healthy Nevada. Dr. Kristi Crymes is a family medicine doctor at the Nevada Medical Clinic. Crymes came up from Springfield three years ago to work in Vernon County, which has some of the state’s poorest health rankings. 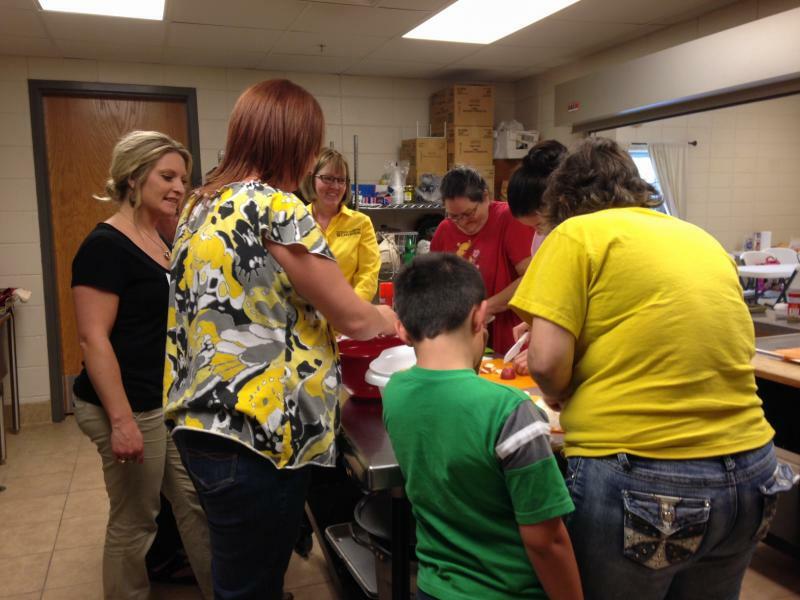 In 2010 the obesity rate in Vernon County was 30 percent. The incidence of adult diabetes has hung around 11 percent for the past 3 years.